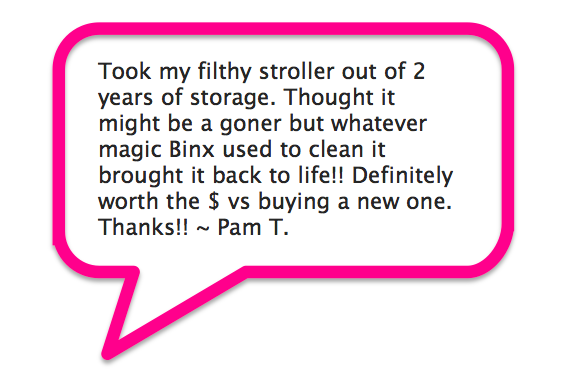 Binx does stroller, car seat and other gear cleanings by appointment! To schedule an appointment please check out our schedule below for upcoming gear cleaning days! 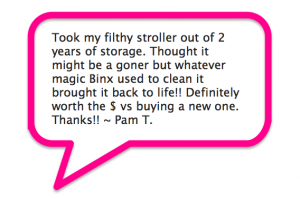 Binx uses the all organic stroller cleaning system from BuggyLOVE! So there’s no worries about having harsh chemicals near your baby or toddler. We accept cash or credit cards for cleanings. A ‘Down & Dirty’ cleaning is a deep cleaning of your stroller. All the milk, mud and more will be removed, wheels will be greased, and it will look brand new! $40/single size stroller, $60 for a double sized stroller. All Car Seat Cleanings are $25 and are very thorough. We will also re-install them for you if wanted. Please contact us for a custom quote for cleaning other gear. We can do items such as swings, pack’n’plays, etc. Pricing starts at $25.